"...great job of incorporating basic and advanced features in a way that is not overwhelming." Adobe Illustrator CS4 Digital Classroom is like having a personal instructor guiding you through each lesson, while you work at your own pace. 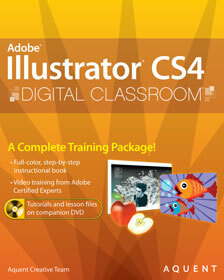 This Illustrator CS4 book with DVD includes 12 self-paced lessons helping you learn essential skills and explore new features and capabilities of Adobe Illustrator.